7 Ways Deepika & Sonam's Bridal Looks Were Same Same But Different! 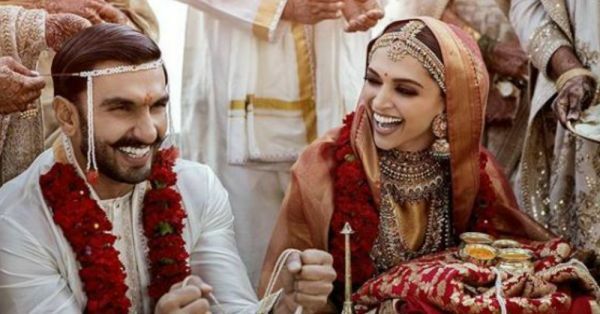 2018 has been the year of weddings for Bollywood - Sonam Kapoor & Anand Ahuja, Neha Dhupia & Angad Bedi and now Deepika & Ranveer. Even Priyanka & Nick's wedding is going to take place this year! And if there is a bride we take inspiration from, it's a Bollywood bride. 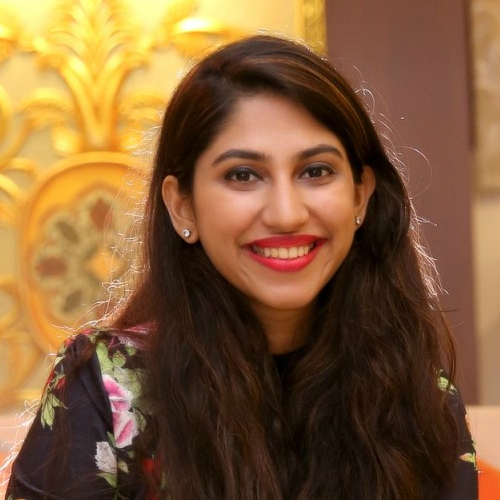 They are the ones who set the trend for all the brides-to-be and since DeepVeer and Sonam-Anand were the two biggest weddings till now, we decided to decode their same same, but different bridal looks. Deepika being a South Indian had a Konkani wedding ceremony on November 14. However, Ranveer is a Sindhi and so the couple even had an Anand Karaj the next day. Sonam Kapoor too sealed the deal with Anand Ahuja in an Anand Karaj ceremony. Both Sonam and Deepika chose to wear red lehengas for their Anand Karaj. While Sonam wore an Anuradha Vakil cherry red lehenga with booti work, Deepika wore a Sabyasachi matka silk lehenga in a deeper red. 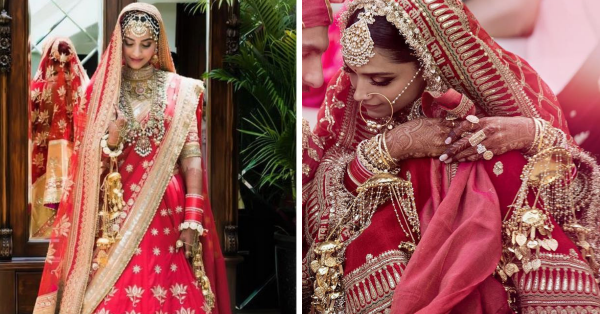 The dupatta Sonam wore had a simple embroidered border while Deepika had a custom-made zari border with 'Sada Saubhagyavati Bhava' embroidered on it. Both the brides wore similar jewellery - a rani haar with a longer neck piece, mathapatti, polki kadas and elaborate earrings. The difference was that Deepika's mathapatti in the Konkani wedding and statement maang tikka in the Anand Karaj were simpler than Sonam's mathapatti which had multiple ladis and pearls. Even for their hand jewellery, Sonam wore haathphools while Deepika chose to wear individual rings in each finger. For both her looks, Deepika stuck to one family of colour. Her jewellery was polki and her make-up had a lot of golds, browns and nudes. Sonam, in this instance, chose more colourful jewellery to complement her lehenga and her makeup had a lot of pink tones. Both the brides' makeup looks were understated. They let the jewellery and outfit speak for itself. But Sonam's look was more dewy and glossy while Deepika nailed the matte makeup look to perfection. From the pictures, we can make out that Deepika had her signature centre parting while Sonam had a pulled back bun. Both the brides wore kaleeras and chooda, as per tradition. Deepika's beautiful pearl kaleeras were designed by Raabta by Rahul while we don't know who designed Sonam's. Also, the chooda Deepika wore was smaller than the one Sonam wore. Both Anand and Ranveer spent quite a bomb on the engagement rings. Sonam's pear cut engagement ring cost Rs 90 lakhs while we're estimating the cost of Deepika's emerald cut must have cost Ranveer a minimum of Rs 1 crore. Woah! Who looked better as a bride in your opinion? Tell us in the comments section!